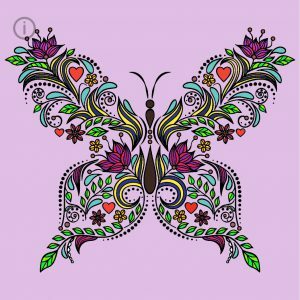 I recently came across some free coloring apps for adults for smart phones. 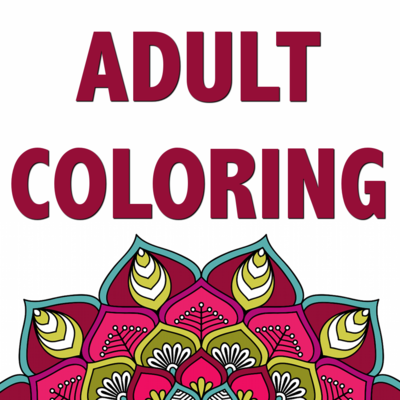 Since I’ve already written a blog on coloring and its benefits to adults for stress relief, I wanted to let you know you can now find coloring in ‘to go’ in a handy portable method, accessible right there on your smart phone. No need to carry books, pencils, sharpeners, markers etc at times when it is impractical. You can download the app, or several, and just open it up on your phone wherever you are, and off you go. 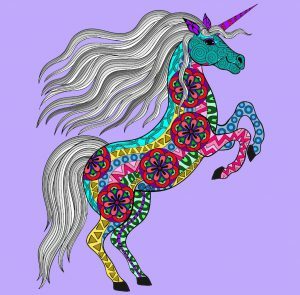 What’s The Big Deal About A Coloring App? 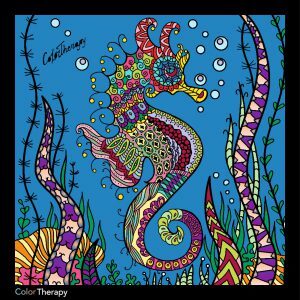 A coloring app can be used to quickly move yourself into a state of mindfulness in the present time and works really well to take your mind off your problems, if only just for a little while. When we are worried or are having an issue of some kind or another, our brains just don’t seem to be able to stop thinking about it. Sometimes taking a break and forcing your brain to do something else, can end up leading you to the solution to your difficulties because you can think more clearly. Once you have diverted your attention even just for a short time, it’s like giving your brain a holiday and it comes back refreshed and ready to focus again. How Does Coloring In Do That? To color in with an app like this, you have to concentrate on the picture in order to color in the correct places, decide what colors to use, and to make sure you are properly detailing the areas that connect with each other on the picture. You need to be keeping an eye on where the pattern is and realising when it’s time to change color. 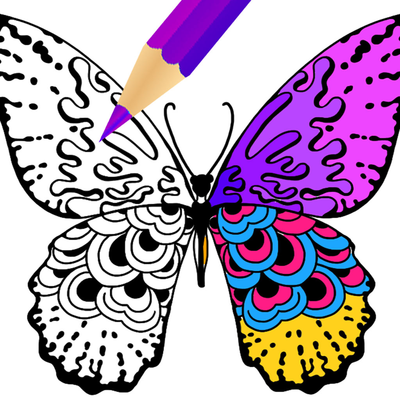 The difference between these coloring apps and a real coloring book, is that you are coloring using a touch screen that fills in the area that you touch with the color you picked, it’s easy to touch a part of the screen and add color to an area unintentionally, or accidentally change a color that you already had filled in. Whereas this can’t happen in a hard copy coloring book. Therefore you need to focus on the picture so that you can notice if you have made a mistake. It is also easy to fix, unlike a real coloring book, where erasers don’t always rub out colored pencils. Because of this need to concentrate, it makes this the perfect app for stress relief. It brings about a peace and tranquility that you probably don’t get to feel all that often. And at the same time, gives you a feeling of creativity, improves your skills at being patient, soothes your inner child, and brings about a sense of accomplishment. Seeing the finished product is really satisfying. 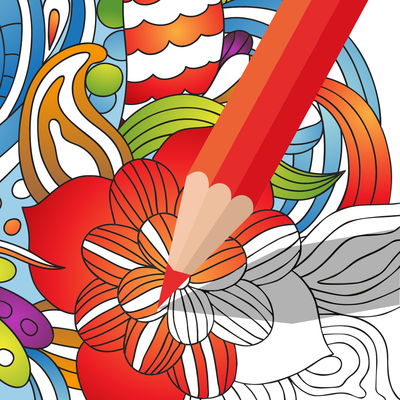 Another of the coloring Apps in the iPhone App Store. 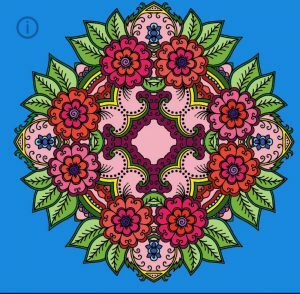 Mandala Coloring Book By App – Adult Coloring – Yes, You Can! Can It Help Someone Relax With Extremely High Anxiety Or Other Disorders? 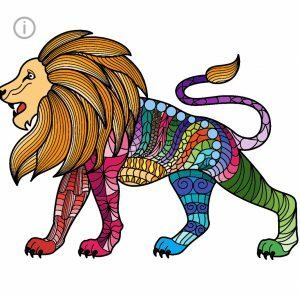 I can definitely confirm that these coloring apps are able to hold the attention of my daughter who suffers from developmental post traumatic stress disorder and adult ADD, let alone what the PTSD does to her in terms of extreme anxiety. For her to sit still long enough for her to complete a picture is a mission. It is difficult for her to bring herself down, in fact, she never really has been properly able to without resorting to other means. She has been using them for a week or so and has really been quite enjoying them. I think what makes it good for her is that she can just open the app up and work on a picture whenever she feels like it. She doesn’t need any special items or space to work, doesn’t need to get anything out for it, and she doesn’t need to try to organise herself, which is quite difficult for her. She can just sit in a chair, indoors or outside in our garden, driving in the car (when she isn’t playing Pokemon Go), waiting for an appointment, anywhere really. When she has finished she can save her work, or some just save automatically, and she can keep it as a wallpaper on her smart phone and feel a sense of accomplishment too, for completing it, or send it to someone. 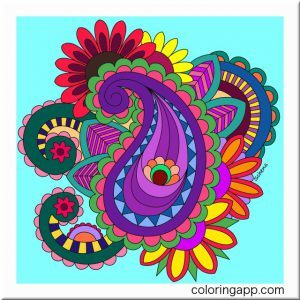 The beauty of these coloring apps, is that they are free for the most part. The apps themselves, mentioned in this article, are free to download, however there are options for in-app purchases. They are also very easy to do. Simply zoom in, touch the screen where you want to place a color, then choose a color to place in that area and voila, done. Although the apps are designed for adults, they are simple enough for children to do them as well because of the touch screen coloring. You can choose to color tiny little individual segments and really go to town on the variety of colors and shades you use, or you can color larger sections by grouping larger segments together and using the same color for each segment. A picture will take around 30 minutes to an hour, but in most apps it is possible to save your work and come back to it if you need to do it in smaller bursts. Some apps even come with a choice of music to play in the background as you color. 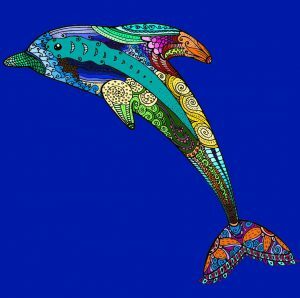 I enjoyed listening to the ocean when I was doing my seahorse in the image at the start of this article. You can save your work as an image, you can message or email it to yourself and for many of the apps you can reset the image and start again with whatever style of coloring takes your fancy today. Some have great color choices, including at least one that has a free option to use colors that have a two-tone gradient and you can choose if you want it to be a radial gradient or a linear one. I’m hesitant to even bother to write about any negatives in using the coloring apps but there are a couple of things you may want to know. I’ve already mentioned one and that is that it can be easy to accidentally color a segment that you have already colored something else or haven’t colored yet, but this is easily fixed using the undo icon. It may get a bit frustrating because some apps are more sensitive to the touch than others. You do have to zoom in to color the majority of the image due to small sections and big fingers covering too much of an area or hitting the touch screen in the wrong spot, which may be harder to keep to your color screen, but you can check it once you zoom back out again and correct if needed. It is very simple. The last thing I can think of is that you may not have access to all of their images, or all of their colors, but in-app purchases can be used to add to what you have in the free version if you so choose. 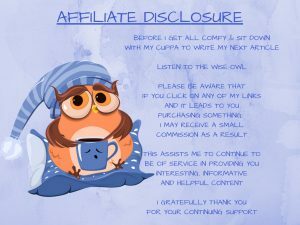 I find that what is provided for free is generally enough and I don’t really need anything else, however, I may decide to buy more down the track. Some apps also add new images as gifts. My daughter was the one who told me about the apps and the one most in need of it. Mind you we both have need of using resources to bring about some form of relaxation or stress relief. She wanted me to look at the picture she was doing so I found out about them that way. I was quite amazed that she seemed quite calm while coloring the picture, and was quite willing to sit for quite some time working on it. She did take a break here and there, but it wasn’t boring otherwise she wouldn’t have bothered to come back to it to finish it. She said she thinks she would most likely be able to sit and complete an entire picture if she allowed herself too, but she is worried she will lose interest in the app if she does that too often. She is currently working on a picture she wants to send to her boyfriend. I asked her what she thinks, whether is has helped her feel more settled at times. She doesn’t like answering at the best of times if it means that she has to delve into her feelings, emotions or thought, but what I have noticed it that it seems to have helped a little with forgetting about her problems for a short while, because I can see in her face she in engrossed in what she is doing. She says the problems are always there and the solution is the elusive recovery that we are hoping for but at least if it allows her some brief respite I give coloring apps a big thumbs up. She also said that it gives her a sense of creative accomplishment. Something she has struggled with since her childhood illness is creativity and imagination. She has felt quite lacking in her abilities in this area. It gives her something she can feel proud of, something she knows looks good and is happy to show others. In fact she has asked me to put a few of her pictures here on this blog, so she must feel good about them and has given the apps her vote of approval in doing so. So here they are, straight from the coloring apps for adults. Hope you like them! My Daughter’s Works Of Art! Thank you for reading this article. If you come across anything like this that I can add to my free resources that I can try to make available, please let me know in my comments section. My readers will thank you. I can’t possibly know all there is to know about what’s available out there, so the more people that can lend a hand in getting the word out, the better.